TOKYO, Apr 16, 2019 - (JCN Newswire) - AMADA HOLDINGS CO., LTD. (TSE: 6113) has decided to construct a human-friendly next-generation manufacturing model utilizing IoT at its main factories in Japan through collaborative creation with Hitachi, Ltd. (TSE: 6501). Hands-free assembly navigation system and automatic production planning system, etc. will be built at the Fujinomiya Works and the Toki Works of AMADA CO., LTD., a company of the AMADA Group that handles sheet-metal processing machines, by April 2020. The AMADA Group will promote a transformation to manufacturing workplaces where diverse human resources can be utilized by not only increasing productivity at its manufacturing workplaces, but also working actively on changes in the work environment such as the elimination of labor shortage and Work Style Reform through the realization of "human-friendly cutting-edge manufacturing" by utilizing IoT. Hitachi will, through collaborative creation with customers, share their important issues and create solutions together with them and also provide the Lumada solutions utilizing advanced digital technologies to contribute to the resolution of customer issues and achievement of the SDGs(1). In recent years, the manufacturing industry has faced a lot of challenges such as the decreasing workforce associated with the aging population combined with the low birthrate, labor shortage caused by the retirement of expert workers who have supported manufacturing on workplaces, an emphasis placed on effectiveness due to the intensified global competition, and insufficient adaption to total optimization across boundaries of company and industry because individual optimization continues. Manufacturing workplaces that give consideration to an environment in which it is easy to work while not relying on expert skills and the cultivation of human resources through the handing-down of skills are also required at the manufacturing factories of AMADA, which manufactures laser machines and other products, given that there are many tasks that rely on the experience of expert workers. Currently, the AMADA Group is establishing a supply system of the products in the sheet-metal business sector such as fiber laser cutting machines and automation support devices with a view to growth in five years starting from its medium-term management plan with 2021 as the final year and promoting the enhancement of production capacity in Europe and the US. In addition, AMADA aims to optimize the production system globally by constructing new plants at the Fujinomiya and Toki Works and a supplier base near Fujinomiya Works. The aim of this construction is to mark the beginning of the reform of customers and a wide range of fields through the machine manufacturer's own efforts to pursue highly efficient production and optimal solutions to social issues. Hitachi is developing Lumada solutions by utilizing advanced digital technologies including IoT. At the Hitachi Group, Hitachi Industrial Equipment Systems Co., Ltd. has been contributing to the enhancement and streamlining of the manufacturing workplaces of AMADA such as by delivering servomotors for punching machines to the Fujinomiya Works of AMADA in 2007 and starting up systems at the tooling IoT factory(2) at the Toki Works in 2017. In light of Hitachi's strength of being able to respond to a broad range of needs from products to OT (Operational Technology) and IT in an integrated manner, which Hitachi has been cultivating for many years as a manufacturer on its own, in addition to the track record described above, the AMADA Group and Hitachi have commenced collaborative creation toward the construction of a next-generation manufacturing model utilizing IoT since June 2018. The AMADA Group and Hitachi are aiming to support and further evolve manufacturing in Japan by bringing together their technologies and knowledge through collaborative creation between the AMADA Group, which has the largest share in Japan and a high level of technologies for sheet-metal processing machines, and Hitachi, which has extensive knowledge of manufacturing workplaces and the open IoT platform of Lumada. As the first step in the concrete activities for collaborative creation, AMADA and Hitachi will aim to build manufacturing workplaces that achieve the same quality without relying on expert workers in the complicated assembly process of large-sized materials used for sheet-metal processing machines. 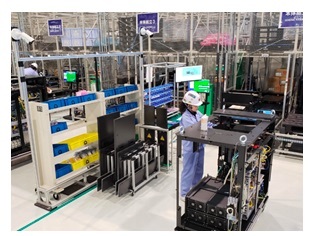 They have constructed a hands-free "Assembly Navigation System" using the voice and image analysis technologies of Hitachi's Lumada at the Fujinomiya Works and started operation of the system in February 2019. 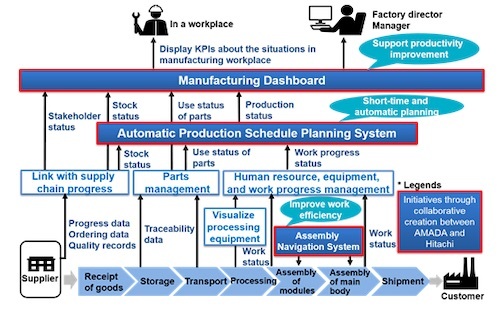 As the second step, to quickly and flexibly achieve various kind/lot production(3), which always entails changes in a production plan, AMADA will commence the construction of the "Automatic Production Schedule Planning System" that has been developed based on the "Factory simulator", an automatic production planning system that has been adopted at Hitachi's Omika Works. Together with the "Manufacturing Dashboard" that visualizes KPIs at the manufacturing workplaces' situations in a unified manner, the systems will begin operating at the Fujinomiya and Toki Works in fiscal year 2020. The AMADA Group aims to increase the diversification rate of human resources three times and improve productivity by 30% at both Works of AMADA by including introducing those systems constructing the next-generation manufacturing model to realize efficient manufacturing that makes it easy to work for diverse employees, regardless of their age, gender and ethnicity. It also plans to expand the system of this next-generation manufacturing model to the bases of the AMADA Group throughout Japan and overseas by fiscal year 2021. The AMADA Group and Hitachi will continue to work on the innovation of "human-friendly cutting-edge manufacturing" through collaborative creation. The Assembly Navigation System has a function that shows guidance in 3D for the assembly procedures and the parts and bolts to be used in each process in the assembly booths for core modules of laser cutting machines and a function that checks and records the person-hours and progress of work by utilizing image analysis through a fixed-point camera when a worker reports the completion of a process by voice through a radio microphone. The 3D guidance function was constructed by AMADA, which enhanced conventional functions. The function using voice entry and image analysis was constructed through collaborative creation between AMADA and Hitachi. These functions enable assembly work to be achieved safely by anyone at the same quality without relying on the skills of individuals or putting a strain on the workers. Because the sheet-metal processing machines of AMADA engage in various kind/lot production, the production schedule always entails changes in plans. Therefore, the production schedules were prepared by expert workers, exerting a lot of efforts and spending a lot of time every month, and reliance on human resource was an issue. The Automatic Production Schedule Planning System automatically draws up an optimum production schedule by analyzing the specifications and delivery times of products and the production capacity of plants, etc. With this, AMADA will aim to plan schedules with approximately one fifth of the person-hours required in the past. Utilizing the 4M(4) in the manufacturing workplaces, the Manufacturing Dashboard shows useful KPIs in graphic form and chronological order when each managing layer such as a factory manager and a production line supervisor considers productivity improvement measures. Specifically, it sets information about the supply situation of parts, the capacity utilization status, and work efficiency of human resources as KPIs and visualizes waste at the factories in an easy-to-understand manner. This will enable each managing layer to promptly accelerate the cycle from the understanding of the situation to the identification, assessment, analysis and improvement of issues from the perspective of total optimization. (1) Of the 17 global goals of the Sustainable Development Goals (SDGs) announced by the United Nations in 2015, the Hitachi Group is focusing on achieving five goals to which it will greatly contribute through its business strategy and six goals to which it will contribute through corporate commitment. News release published by AMADA Holdings on May 21, 2016 "Growth strategy plan for AMADA's new Tooling Business and the Service Construction of a tooling IoT factory at AMADA Toki Works Total investment of 10 billion JPY"
(3) Various kind/lot production: A type of production in which the product type for production varies from period to period and the production volume also varies each time. (4) 4M:Man, Machine, Material, and Method. Founded in Japan in 1946, The AMADA HOLDINGS (TSE: 6113) is a global comprehensive manufacturer of metalworking machines. The Group's main businesses include the development, manufacture, sales, leasing, repair, maintenance, checking, and inspection of metalworking machinery and equipment. The group has over 8,000 employees and about 130 bases in 30 countries and approximately 90 companies including its subsidiaries and affiliates. Our results for fiscal year 2017 were net sales of JPY 300.6 billion and net profit of JPY 29.8 billion. The Group's core operations in metalworking machinery center mainly on four businesses focusing on sheet-metal machinery (AMADA), metal cutting machinery, structural steel cutting machines and machine tools (AMADA MACHINE TOOLS), and precision welding (AMADA MIYACHI), stamping press machinery, automated equipment for press machines and spring machines (AMADA ORII). In addition to its main businesses, the Group also provides total solution services ranging from computer software and peripheral devices for controlling metalworking machines to tooling and maintenance.